← Bellevue endorses NACTO guide + Could they beat Seattle to building a downtown protected bike lane? The city is nearly finished with work on two blocks of protected bike lanes on NE 40th Street in the U District. As we reported last week, the section is intended to serve both as a permanent addition to the bike network and to help people detouring around construction on the Burke-Gilman Trail and on Brooklyn Ave.
As with all protected bike lane projects, the biggest challenge is the intersections. 40th and Brooklyn was already a four-way stop (temporarily 3-way stop due to construction west of Brooklyn), and that will remain essentially the same. 40th and the Ave had a traffic signal, but SDOT engineers studied use and determined that the vast majority of cross traffic was actually people walking. So they turned the signal into a flashing red all-way stop, which should decrease the wait time for people walking and help traffic flow, SDOT Traffic Engineer Dongho Chang told the Seattle Bicycle Advisory Board. At 40th and 15th Ave, SDOT added a “scramble” phase, also known as an all-walk phase. This allows people on foot to cross diagonally, saving them potential wait time. The city also added signs telling people biking they can go during the walk phase, but to yield to people walking. We’re working with UW on the west side of Lincoln Way to see if we can provide additional improvements from the off-ramp to the 5-way intersection/connection to the Burke. Lincoln Way was vacated and is now UW’s property, so SDOT does not have the ability to make changes through that section. They have lots of construction activity on the building side so they may not be able to provide much of a facility for bicycle riders and pedestrian in the short term. UW is making some amazing improvements along the Burke so it’ll be worth the wait. One exciting aspect of the new protected bike lanes is the fact that the city built them as though they were just part of the normal way we do road work these days. As the City Council is (hopefully) on the verge of passing a Bike Master Plan that includes 100 miles of protected bike lanes, it is not practical to debate every block of them to death. Big projects need lots of outreach, of course. But projects like upgrading existing paint-only bike lanes (the case here) should not always require such work. This entry was posted in news and tagged dongho chang, NE 40th Street, protected bike lanes, u district, uw. Bookmark the permalink. I am absolutely loving the bigger bike lanes near UW, and I’m thrilled they added a 4-way pedestrian cross to the intersection at 15th & 40th. However, I have one small complaint, which I’m hoping the city can fix! When they enabled the 4-way cross as part of the cycle at 15th and 40th, they disabled the directional crossing during the other parts of the cycle. This means pedestrians may only cross at one point in the cycle: the 4-way cross. The upside is that cars turning in/out of UW on 40th won’t have to compete with pedestrians crossing for the entire cycle. The downside is that pedestrians pile up during busy periods of the day, crowding the corners of the intersection. Frequently they just cross anyhow, assuming the signal is just broken. 2) Re-enable the directional crossing during the corresponding directional traffic portions of the cycle. Re-enable the directional crossing during lower traffic periods (early AM, weekends, evenings), and put a few signs up to help clarify things. If the light is green in the direction of travel, everybody will continue to cross anyway, walk sign or no. I, too, am dismayed that SDOT disables single direction crossings when they install a scramble (see 1st and pike for another location that suffers). But, as a pedestrian who has been bowled over the hood of a right turning car at that very intersection, I understand their reasoning. I just stumbled across this improvement last night. I had no idea it was planned. Was a refreshing couple of blocks to ride on. Looking forward to much more. I think the city should put some sort of “Bicyclists may use ped signal, yield to peds” signage on every intersection where they do the scramble phase. There are a few downtown now and I don’t want to use them for fear of perpetuating the scofflaw cyclist stereotype. In typical SDOT fashion, the rollout of the new bike infrastructure doesn’t seem to be coordinated with the installation of signage. There’s actually no indication anywhere that these are supposed to be bike lanes, other than that they’re narrower than other lanes. Well, there is the little sign that says “bikes use ped signal,” but that’s on the far side of the street — and now that it’s an all-way walk, as a cyclist going straight, you have to deal with students crossing diagonally in front of you from every angle. It’s also unclear how you’re actually supposed to get to the cycletrack if you’re biking westbound on Grant continuing onto 40th — you have to wait for the green light and then cross to the left of oncoming vehicle traffic just to continue straight? Is that the idea? I agree, it’s very difficult to get onto the protected lane from Steven’s, but I think it can be treated pretty mush as a left turn. My bigger concern, however is how one is supposed to turn right across all lanes of traffic to go northbound on university (the nearest northbound bike route to campus). Is there some procedure/etiquette that I’m missing? 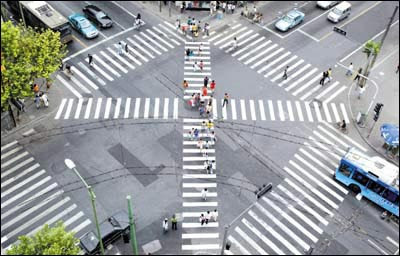 Now if they would only take it up a notch and add the zebra crossings on the diagonals like they have in Japan. University Way and Campus Parkway should also be converted to a 4-way stop. There isn’t a huge amount of traffic there to begin with and buses comprise a large portion of what motorized traffic there is. Under the current configuration, buses spend an inordinate amount time waiting for the light with negligible cross traffic. Bikes and peds routinely cross against the light once they see that nobody’s coming the other way. I actually sent an email to SDOT with this suggestion, but never heard back. Maybe if a few more people also email? As awesome as this is (and it actually is), the real improvements on 40th need to happen between 7th Ave NE and Latona. That stretch is far more dangerous than the stretch in the U-District, whether you’re on the upper fork of 40th or the lower fork due to the odd lane widths, the passing zone, poor visibility from the hill crest, and people treating 5th Ave NE as an offramp from I-5 (which it sort of is). Removing the parking and putting in a simple bike lane would actually make it safe not only for bikers, but also for pedestrians due to enhanced visiblity at the intersections. I’ve emailed SDOT several times about this, not really expecting any response, and not getting any. Curious to know if there’s been any legal analysis behind bikes using the all-way pedestrian phase. By law, bikes in the street must obey signals for vehicles; bikes on crosswalks must use signals for pedestrians. If those a bike *lanes*, then people on bikes are in the street and must obey vehicular signals. If that’s actually a sidepath or 2-way trail, then it would be a crosswalk where it crosses the intersection, and people on bikes should obey pedestrian signals and right-of-way rules. The City Council really should update the Municipal Code to recognize the existence of 2-way sidepaths, or else this will all have to be sorted out in court when people get hurt. I came across the shutdown off ramp northbound off of the Universuty bridge, and just went for it past the Road Closed signs. It was pretty easy, you can ride down half of the ramp, then go over a crub and ride on the grass for 200 feet down to 40th. Given that this is a major bike route, I find it absurd that minor fixes weren’t done to accomodate bicycle drivers. A ramp over the curb and some compacted gravel is all that’s needed to make it a decent detour. And some signs letting cyclists know that in fact, the road is not closed. I’m curious about the short, vanishing “bike lane” on WB 40th at the intersection with 15th. Is the idea there to serve cyclists turning right onto WB 40th from SB 15th? Then they find a break in traffic and veer left into the 2-way bike lane? This is correct going eastbound on 40th where is a sign saying go with the pedestrian signal (perhaps ambiguous from a legal perspective as suggested by a response above). Not good. Paint AND bike signals now please. Until then I’ll stay on the north side of 40th in the regular traffic lane as I head west. The best thing about this project so far is the resurfaced street.